Tip: Hold mouse button and move around to rotate the 360° animation. Ideal for hospitals, nurseries, schools, hotels etc. 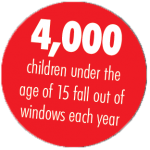 The Royal Society for the Prevention of Accidents provides research that states that in the UK over 4,000 children under the age of 15 are injured yearly from unsecured windows which they fall out of, with 2,000 of these accidents involving children under 5 years old. A small yet very effective and extremely affordable solution is the UAP window restrictor. 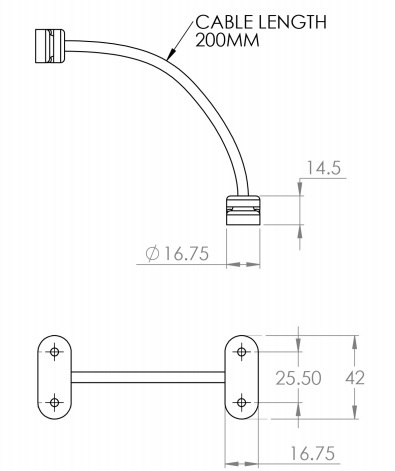 The window restrictor has a 20cm long cable, which when installed correctly will limit the opening of the window to under 100mm. Not only will this prevent children from being able to fit through the gap, but it also allows enough air to circulate around a room. The fixed window restrictor cannot be unlocked, and therefore cannot be used on fire escape windows. The fixed window restrictor is ideal for places where you do not want the window to full open i.e hospitals, mental institutions, nurseries, schools, hotels etc. One of the important features on the UAP window restrictor is the strength of the cable once locked into the locking system. 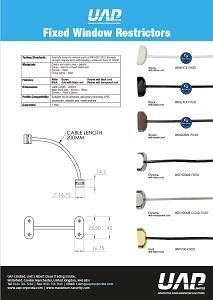 Some window restrictors claim that the strength of the cable exceeds 500kg. However, even though this may be true, it does not mean anything as it is the strength of the cable once locked into the locking system that actually matters. The UAP window restrictor, once the cable in locked into the locking system, can withstand forces over 100kg, which is more than enough to take the weight of any child. This is twice the industry standard which is 50kg! The cable itself is made from hardened steel, which makes it extremely difficult to cut. It makes the window restrictor ideal for customers who are based on ground floors, and want to leave their windows open but are afraid that they may be broken in to! What makes the window restrictor even more unique is that The UAP Window Restrictor is Biomaster Protected – Protection against the dangers you can’t see. 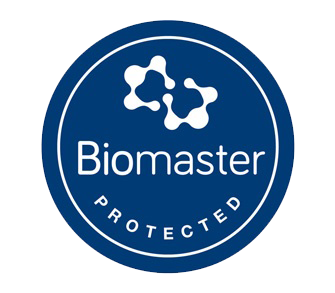 Biomaster ensures effective antibacterial protection for the effective lifetime of the product, helping to keep surfaces clean and hygienic, and reduces the threat of cross-contamination from harmful bacteria – such as MRSA, E.coli, Campylobacter and Listeria and even viruses like the common cold and influenza. Window restrictors, especially those found in commercial properties such as schools, hospitals and hotels, are often handled by many adults and children and can therefore facilitate the spread of harmful infections. The window restrictor is available in 6 finishes. We have recently introduced polished gold and polished chrome window restrictors into the range, to colour match to window handles and other window hardware. Other finishes include brown, black, and our most popular finish – white. 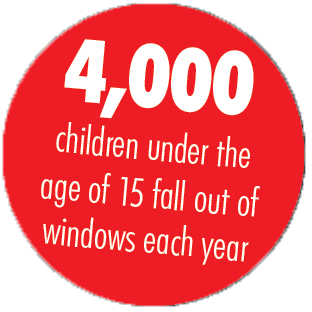 Help prevent child injury and help protect your client’s windows with the UAP fixed window restrictor! At UAP we are constantly striving to improve on the products we already supply as well as develop new, pioneering ranges and practical product solutions. Used to test the colourfast of plastic and anodised products, the UV machine measures the stamina of the window restrictor finish, testing how quickly it will fade in sunlight. It does this using UV lights which the products are left under for 2000 hours. 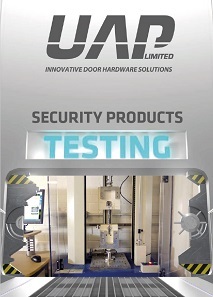 UAP Ltd distributes a wide range of window security products, including window restrictors and sash jammers. 1. The window security products are applied to a window, door or door panel, and no item of door or window furniture on the window, door or door panel are sealed or fixed using any form of silicone sealant or the like. 2. The window security product is fixed correctly and the right way around using the correct fixings, and are not scratched or damaged at any time during the installation process or thereafter. 3. The window security product is installed inland (defined as 25 miles from the coast or 5 miles from highly populated industrial areas) and are cleaned monthly with a moist cloth. At no point should any form of cleaning agents be used. 4. No claim will be accepted for any window security product that is scratched or mutilated or fitted incorrectly. 5. The guarantee only applies if the window security product is fixed to the original window or door for which it was bought and fitted by the installer. The guarantee will cease immediately if the window security product is removed from the original window, door or door panel. 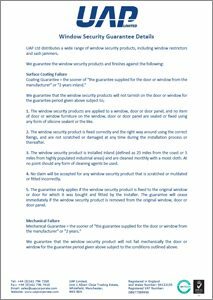 We guarantee that the window security product will not fail mechanically the door or window for the guarantee period given above subject to the conditions outlined above. Every product must be inspected before they are fitted on to a door, window frame or door panel for any defects. If any defects are found then the product must not be fitted and the fault reported immediately to UAP Limited. Any product fitted is assumed to have been inspected and approved as being fit for purpose. To make a claim under the guarantee, UAP Limited must receive in writing the product code of the item, the full details of the problem, the date the product was purchased, the date of manufacture of the unit in question and the address of the installation. We will require all ‘faulty’ items to be sent to ourselves at the address below by first class recorded delivery post. We will then examine the item in question and confirm whether the item is covered by the guarantee. If it is not covered by the guarantee we will advise you, the customer, in writing of the reason for rejecting the claim. UAP Limited’s guarantee will be limited solely to the replacement of the item purchased from UAP. There is no liability whatsoever for consequential damages or costs, howsoever calculated or incurred. UAP Limited will enforce and rely fully upon their terms and conditions of sale in all aspects other than the limitation set out above. UAP will also pay for the cost of the recorded delivery, if and only if, the product is deemed to be covered by the terms of the guarantee set out above. UAP reserve the right to discharge the guarantee claim in the form of replacement products at the customer’s normal buying price at the time of the complaint being received by UAP Limited. UAP will only be liable for claims made within a maximum period of 10 years from the date of purchase of the products from UAP Limited. Any guarantee claim must adhere to the system set out above in all respects and must be made in writing to: UAP Limited, Unit 1 Albert Close Trading Estate, Whitefield, Manchester, M45 8EH. The terms of this guarantee may be varied by UAP Limited at any time at our own discretion. Please see www.uapcorporate.com for up to date product guarantees.